People often ask me if cats can get asthma. Unfortunately, the answer is a definite, “Yes”. 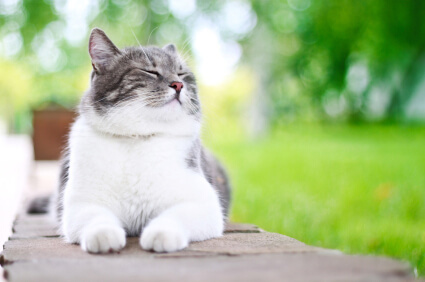 The signs of feline asthma can come on quite suddenly and can constitute a medical emergency, so let’s review this condition in some detail. The Dr. Jane’s HealthyPetNet Foundation is gratified to bring you news of our latest grant, awarded to Richardson Rescue, a medium-sized group in York, SC. Richardson Rescue has been rescuing pets since 2003. The mission of this Carolina rescue is to provide shelter and care for both dogs and cats, and ultimately to place them in forever homes. In addition to these vital services, they also provide a low-cost spay-and-neuter program for local families subsisting on low incomes. An ardent advocate on behalf of animal rights, founder Janet Richardson views her work as falling under the umbrella of “preserving the sanctity of animal life”. As goals go, it’s our opinion that her rescue agency has become a great success!